My husband and I are always looking for new, fun things to do when we are lucky enough to have an evening off from our parental duties. 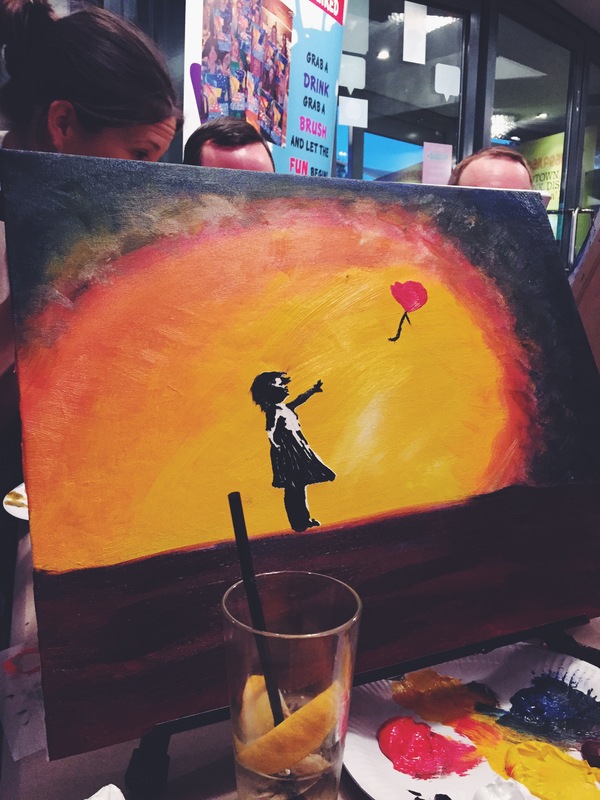 We heard about this company called Social Paint who organise ‘pop up paint parties’ in Milton Keynes. Don’t know what one of those are? Don’t worry, we didn’t either at first. 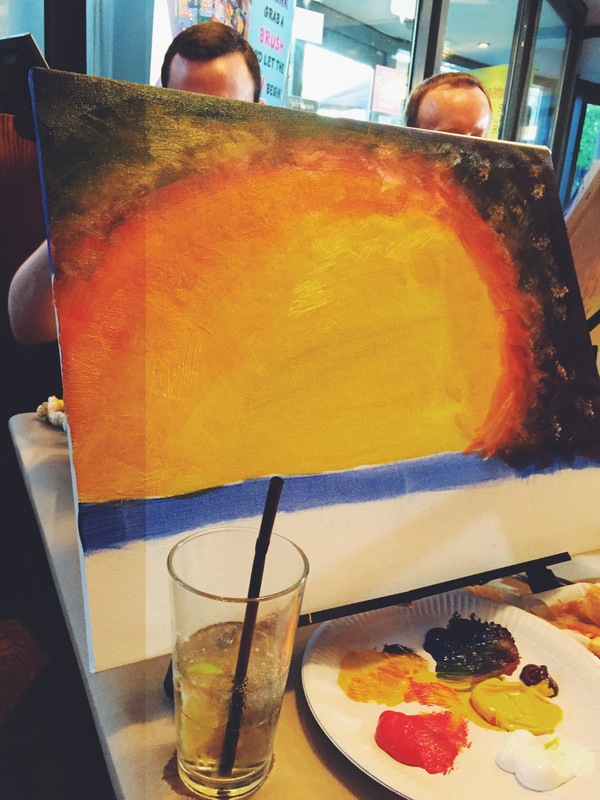 Think drinks, giggles with new faces and getting creative painting beautiful pictures. Usually held in pubs, restaurants or the like, they are places we tend to spend our evenings out anyway, but this time with a really quirky twist. We agreed to give it a go, so on Thursday night we went down to The Slug and Lettuce in the Theatre District to see what all the hype was about. As a complete amateur, someone who hasn’t held a paintbrush since they were at school. I must admit I was a little anxious about painting a ‘proper’ picture. Worried I could make myself look like an idiot by making a big mistake or having the ‘worst’ painting in the class. EEK! But Social Paint’s slogan is ‘No experience required’ and they promised to help find our inner artist and help us express our creativity. We didn’t even have to bring anything with us as all materials and tools are provided. We were told to turn up and have fun making a big old mess. Okay, I’m down with that. 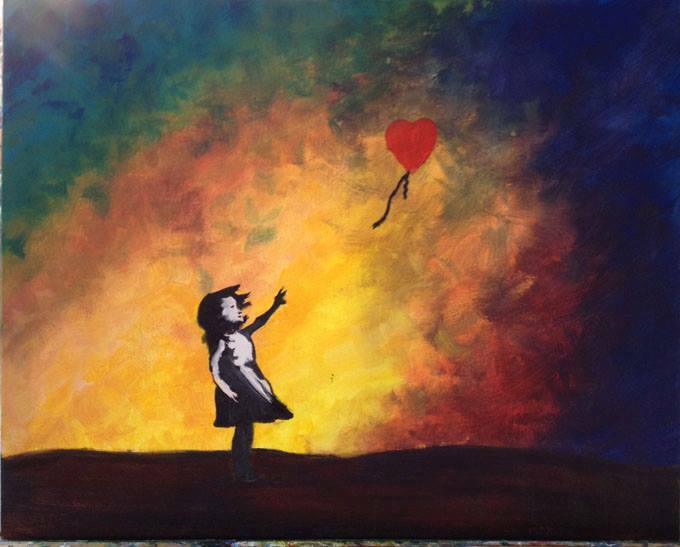 The piece of art we were going to create is called “Banksy Inspired Love” and it was on display when we arrived. Looking at it, I couldn’t help but feel that I could never ever in a million years create something that remotely looked as good as this. 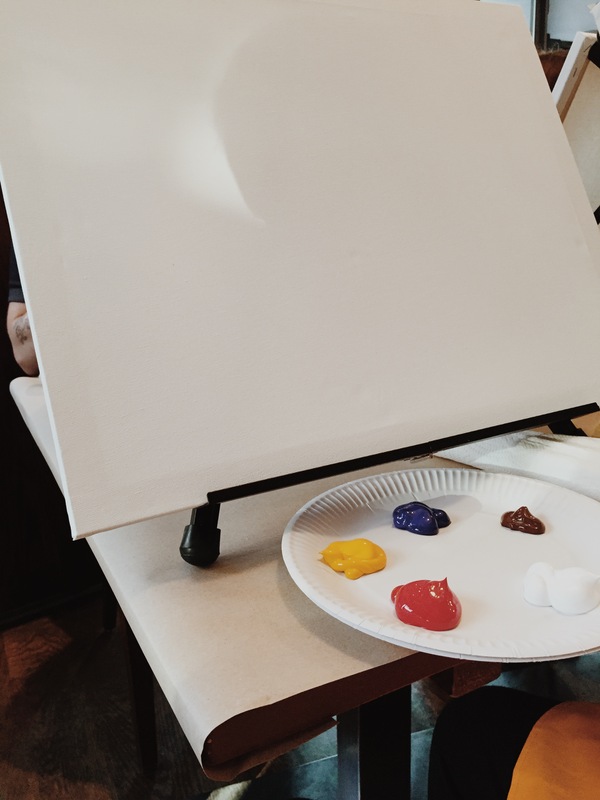 Waiting for the class to start and with my drink in hand, I tied my apron up and took a seat in front of the blank canvas. Julie, the owner of Social Paint was hosting and was the ‘art teacher’ for the evening. She welcomed us all and gave us the most impressive pep talk for those of us who were daunted by the paints in front of us. Within minutes she had me at ease. So much cheerful, bubbly and relaxing energy comes naturally spilling from this lady. She had us cheering, raising our glasses and made us realise we were all in the same boat. Not one of us there was a painter or an ‘expert’ we had all come because we were curious about spending our evening meeting new people, having a drink and trying something new. Julie has a real talent for explaining things quickly and clearly. Her energy, passion and spirit is truly infectious and definitely helped make the night all it was. I thought it was hilarious that the paint brushes we used had nicknames. My favourite was the biggest brush we used for most of the blending of background, he was called Bruce! Never once throughout the evening did it feel forced or uncomfortable. We were laughing with fellow painters around us and clinking glasses of drink. It genuinely felt like we were hanging with friends whilst doing something amazingly creative. If anyone did make a stumble or had a mental block Julie or her colleague were at our side in an instant to give us a bit of a pep talk, paint top ups or some expert advice. We had a break in the middle of the evening which was a good chance to refill our glasses and I was surprised to see an amazing spread of finger food laid out for us. There was nachos and dips, chicken lollipops, bruschetta, sliders and salad. Nom, nom, nom! The pit stop really invigorated us all and we were ready to push on to complete our painting. There was no rushing or hurrying up to finish, but when we all felt like we had finished, we had a brilliant group photo taken of us all to remember the evening. When I stepped back from the easel and saw what I had managed to paint, I was so surprised. I had painted this!? Surely there had been some mistake. If Julie can help achieve this sort of result from me, then ANYONE can paint and enjoy it. Maybe the best part of Social Paint is that you get to take your finished canvas home to keep forever. Here’s my finished painting here (I’m already trying to decide where I can hang it proudly in my home as a momentum to the whole experience). 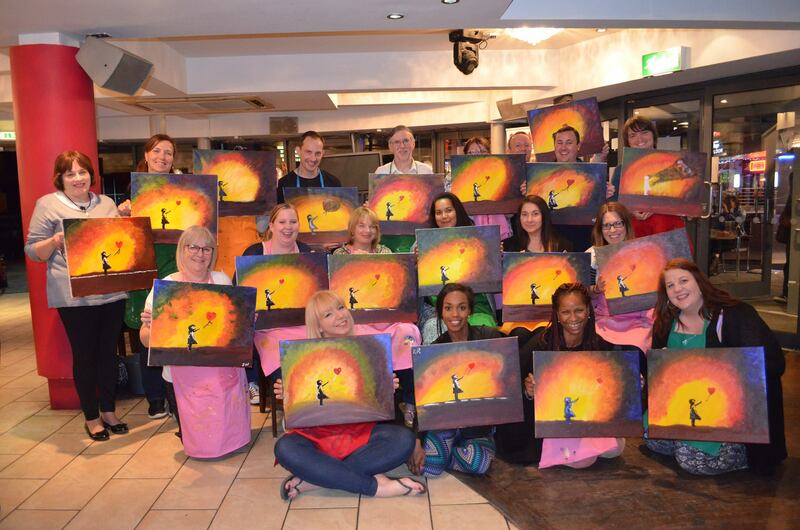 Social Paint can be found on Facebook and Twitter and they run regular nights out in Milton Keynes and the surrounding areas. They often offer early bird ticket discounts which make for an incredibly good value for such a unique night out. I came away from the evening feeling so chuffed and cheerful from the whole experience and I can only recommend for you to try one. Being creative is part of who we are and finding an outlet for it in an enjoyable way was definitely therapeutic. What a brilliant find in Milton Keynes! Looks as though Social Paint is no longer in business. I run Painty.co.uk which is similar and based in Birmingham. I was wondering about running something in MK – What do you think?